I wrote an prior blog describing how I felt the initiative process will become the norm for San Jose and that seems to be the case. The threshold to gather signatures is obviously attainable, which can be attributed to the work and funding of organized groups. San Jose has four signature drives completed or in the process of finishing in the last 12 months: medical cannabis collective’s repeal of an ordinance (similar but different); the minimum wage initiative; the soon to be turned in “layoff police for libraries” initiative; and theexpansion of card clubs initiative. Initiatives are part of our democratic process. Items are placed on the ballot for voters to have their say. In my view, nowhere does the limited pool of signatures trump the entire population of San Jose. To be consistent, if and when new initiatives come forward, they should go on the ballot and that group should have the responsibility of running an election campaign. But the initiative process requires a city, county or state to spend money to place an item on the ballot. Lectured guilt should not be used as a way to potentially implement a negative initiative in the future. Maybe a future initiative bans pit bulls and german shepherds. Maybe a future ballot initiative bans loud motor vehicles. Maybe a future initiative bans certain types of legal business. It could be literally anything a city is allowed to do, so it’s best to be consistent. Consistency was the principle I shared on the dais concisely, rather than speaking in a repetitive and circular fashion for a long period of time. However, based on the comments from my colleagues, it looks as though the majority of the City Council will be endorsing the minimum wage ballot measure this November. 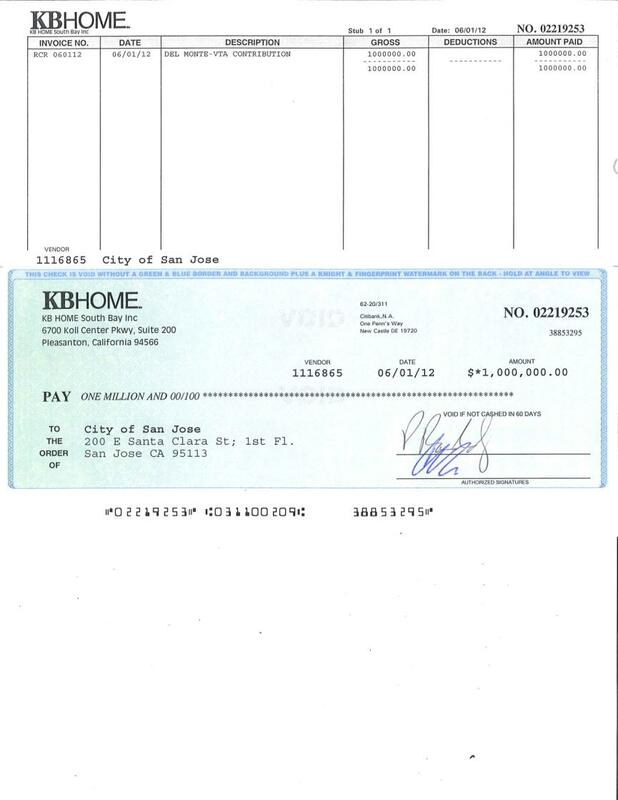 On a separate note, I am pleased to announce that KB Homes dropped off a check for $1 million dollars to public works on June 1. I wrote about this on my last blog, which covered how lobbyist Jerry Strangis used his “friendly” relationships with certain councilmembers, like Nancy Pyle, to convert land from jobs to housing.